1975 - With Motown suing to prevent the Jackson 5 from leaving the label, the remaining members of the group, including Michael and Joseph, counter-sued the label. 1979 - The Jacksons perform Destiny tour in Dayton[US]. 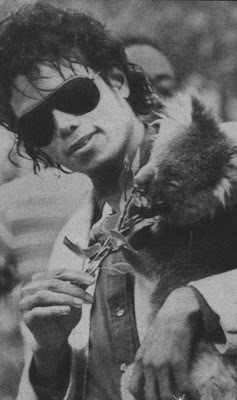 1985 - Michael visits the animals from the "Cohuna Wildlife Sanctuary" in Perth, Australia. 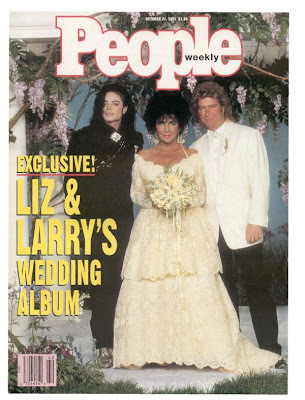 1991 - Michael, Elizabeth & Larry are on the cover of People magazine[US] with the Story Headline: Exclusive! Liz & Larry's Wedding Album. 2000 - As part of its series on pop legends, the RSI Rete Tre radio station in Switzerland aired a program about Michael Jackson. 2001 - Michael took over the stage again at the United We Stand – What More Can I Give concert, a benefit concert organized by the artist and staged at the RFK Stadium in Washington, D.C. at 1:00 p.m. in front of a sold-out audience of over 46,000 people. Under a spray of red, white and blue confetti, Michael - joined onstage by the other artists - sang his new song written for the attack victims, What More Can I Give? with all the artists of the night (including Usher & Mariah Carey) Prince, Paris, Macauley Culkin, the Cascios & Marc Shaffel attend the concert backstage. 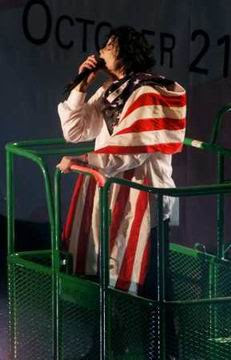 Before the final all-star performance from the United We Stand: What More Can I Give tribute concert organized by Michael Jackson and held on October 21, 2001 in New York, in benefit of the victims of the 9/11, the artist takes the audience 'to church' when he makes an emotional speech in front of the audience. The half day long music and entertainment festival featured performances by many of the world's leading entertainers, ranged from classics including Janet Jackson, James Brown, Al Green, Carole King, Rod Stewart, Bette Midler, America, Aerosmith, and Huey Lewis to modern-day contemporaries of the time including Destiny's Child, P. Diddy, the Goo Goo Dolls, Train, the Backstreet Boys, Usher, Mariah Carey, Pink, and 'N Sync. Each performer did a brief set usually amounting to about five songs apiece. The concert opened in the early afternoon with the National Anthem performed by the Backstreet Boys and lasted well into the night. Michael Jackson performs alongside a host of other artists his relief songs We Are The World, Man In The Mirror and What More Can I Give at United We Stand: What More Can I Give, and collecting $15 million for the victims of the terrorist attacks in New York City, N.Y. The benefit gig was the third major concert in tribute to the 9/11 attacks. The other two were held in New York City. During the telecast of this show on ABC, there was no mention of Michael's name and he was always filmed with the rest of the singers in the background; this was because Jackson signed a contract with CBS over the 30th Anniversary Special (from September 10) to not appear under his name in any other program. Michael recorded the all-star tribute that year, which included stars such as Ricky Martin, Destiny's Child, Shakira, Celine Dion and Gloria Estefan. But despite the commercial power of such a line-up, Sony Music did not release the song, much the singer’s bewilderment. United We Stand: What More Can I Give? raised about $2 million through the sale of more than 46,000 tickets. It was one of three benefit concerts over the weekend. Proceeds benefit the American Red Cross Liberty Relief Fund, the Salvation Army Relief Fund, the Pentagon Relief Fund and Rewards For Justice. Two hour TV special edited and aired on ABC TV in the U.S. on 1st November. This entry was posted on 21 October 2010 at Thursday, October 21, 2010 and is filed under 1975, 1979, 1985, 1991, 2000, 2001 . You can follow any responses to this entry through the comments feed .